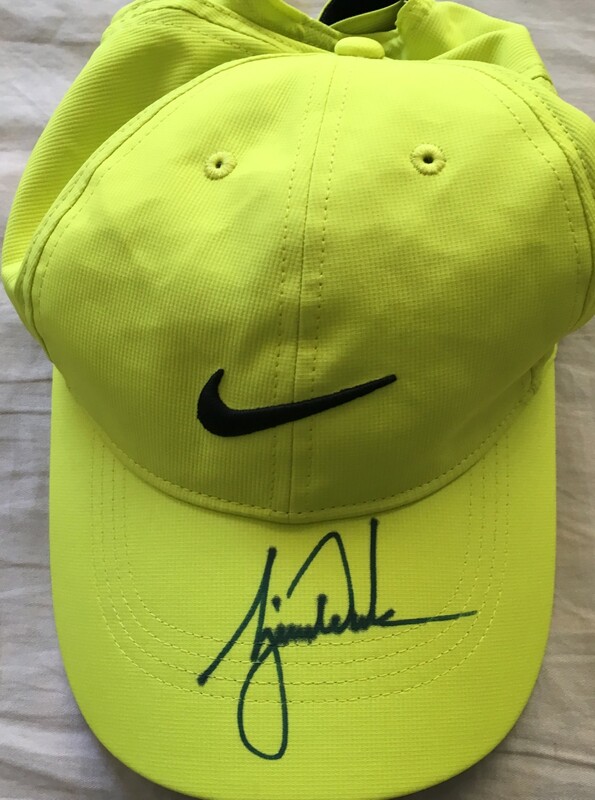 Bright yellow Nike cap or hat autographed on the bill in blue Sharpie by PGA Tour superstar Tiger Woods. Obtained in person, with certificate of authenticity from AutographsForSale.com. NOTE: signature has minor bleeding noticeable upon close inspection. ONLY ONE LEFT. PLEASE BE AWARE THAT 95% OF NON-UDA TIGER WOODS AUTOGRAPHS OFFERED ON THE INTERNET ARE FAKE (INCLUDING THOSE AUTHENTICATED by GAI). This autograph was obtained in person at the 2018 Genesis Open near Los Angeles. Tiger Woods autographed 1996 Newsweek magazine inscribed Best wishes!